← Jay Finn’s “Fastian” just got a cover! Which books do you go back to? That got me thinking of books I’ve returned to again and again over the years. 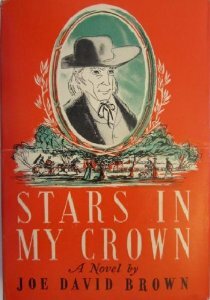 One of my favorites to re-read is Joe David Brown’s long out of print Stars in My Crown. I never tire of the story told by a boy about being raised by his Parson grandfather and grandmother. If you can find it, I’d strongly recommend you give it a read. Pop over to The Misanthropologist for a delightful read! This entry was posted in Books and tagged author, book, literature, Reading, reblog, writing. Bookmark the permalink. 3 Responses to Which books do you go back to? I have re-read Chocolat by Joanne Harris so many times that I have lost count of it. There is something magical and rebellious about the main character that never fails to charm me away, every time I re-read the book. The Sun Also Rises. Don’t know if I’ve ever re-read another book but this one is always my next possible read. Sure and that’s a good one to re-read! Thanks for coming by, Eric, always good to see you here!